Click here to Preorder now!!! that his current flame, Bereet was still aboard. They then traveled to Knowhere to sell the Orb to The Collector. But when Quill and Gamora are captured by the Ravagers, Rocket, Groot and Drax take the Milano to attack Yondu’s carrier, threatening to blow the ship up if they didn’t hand over their friends. Thankfully, that became unnecessary, as they were able to convince the Ravagers to assist them against Ronan the Accuser. 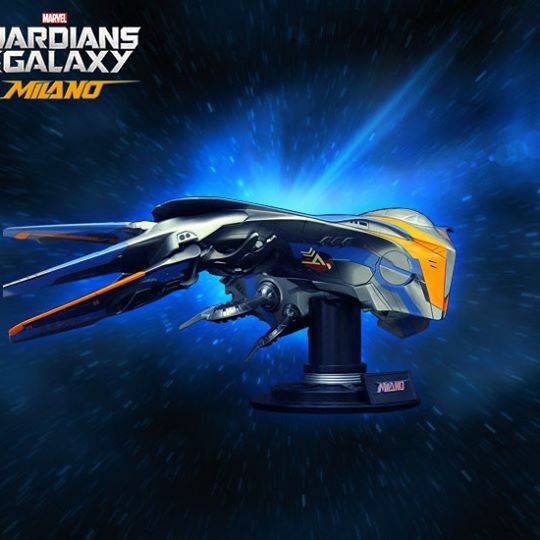 The Milano later flew in formation with the Ravagers over Xandar against Ronan’s ship, the Dark Aster, and the only ship to penetrate the mothership. It is subsequently destroyed when the Dark Aster crashed into the capitol city, though the Nova Corps later rebuilt it out of gratitude for saving Xandar. The newly named Guardians of the galaxy then depart Xandar in the Milano for their next adventure.